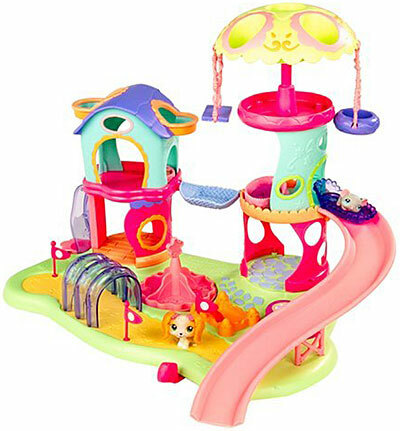 The Whirl Around Playground is the ultimate play park for all your fun-loving pets. They can race through the obstacle course to win first prize, slide, ride the merry-go-round and enjoy the view from the treetop. Slide lever and pet magically races through the obstacle course. Fun features include spinning treetop swing and merry-go-round, obstacle course and slide. Playset includes puppy with sunglasses, mouse, bed, sled, and food dish. Each toy pet contains magnet.